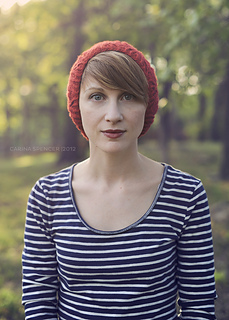 Pattern is written in one size to accommodate the average adult female with a head circumference of 20-24”. Pattern includes written and charted directions for two gauges to accommodate sport - worsted weight yarn. 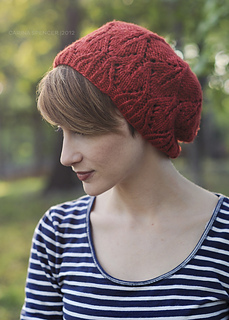 Knits up fast from brim to crown and is simple enough for an advanced beginner. 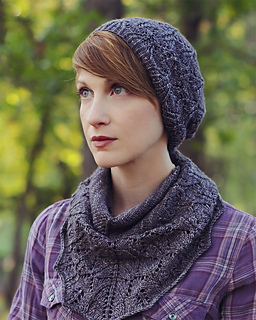 This pattern has a coordinating cowl. Check out Zuzu’s Petals for a matching set! 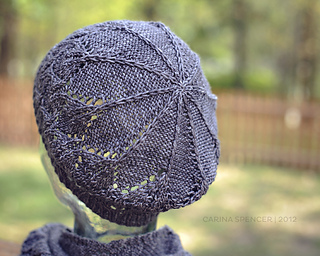 Yarn: Yardages listed are generous estimates. It’s always better to err on the side of too much yarn rather than too little. When in doubt, buy the extra skein for insurance. When working the SM gauge you will need approximately 150 yards of sport weight yarn. When working the LG gauge you will need approximately 130 yards of worsted weight yarn. Samples were knit in Madelinetosh Pashmina in “Tern” (grey, sm gauge) and Malabrigo Twist in Sealing Wax (red, lg gauge). Needles: Double pointed needles and 16” circular needle in size required to obtain gauge AND two sizes smaller. Notions: 1 st marker, a darning needle for weaving in ends. SM GAUGE (for sport weight yarns): 22 sts = 4”. Suggested needle size US 5 or 6 (3.75 or 4mm). LG GAUGE (for worsted weight yarns): 19 sts = 4”. Suggested needle size US 8 or 9 (5 or 5.5mm).